What were your workouts & nutrition like before joining Healthtrax? My career was one that required a 12-13-hour work day, and my meals were usually at the conclusion of my work day and were often fast food. Fortunately, weekend meals were healthy. Consequently, my weight and physical condition were in my opinion major issues. My exercise amounted to the occasional bike rides and an occasional paddle in my kayak. What are your workouts like since joining Healthtrax and what specific results have you seen? My workouts are interesting and challenging. Because of my lack of exercise for a long period time, Mike organized the sessions so I would build strength, but not be overwhelmed with the exercises that I was not able to complete. As I mastered the exercises, Mike gradually increased their intensity. Thanks Mike! During the past year I have seen a weight loss that has been encouraging. It is interesting to note, during the latter part of 2018, I began to have issues with my knees, Mike works closely with my physical therapist to help me address these issues. What surprised you about working with Trax Trainer, Mike? 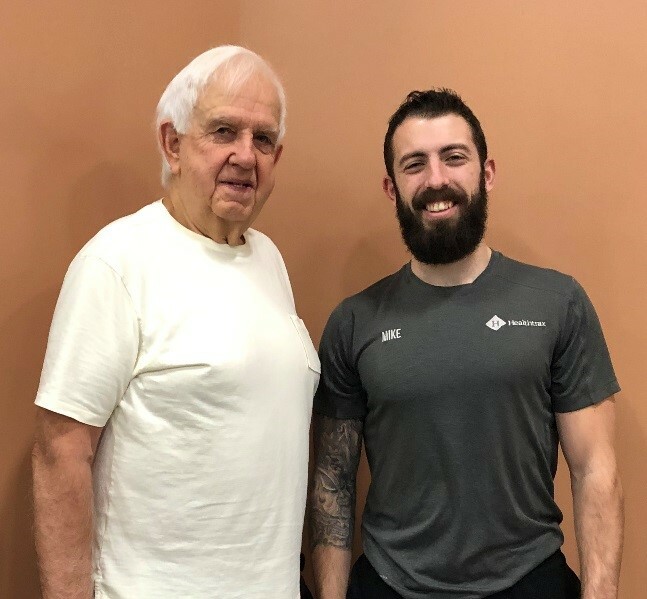 Mike understood me and my condition and encouraged me to continually try to do the prescribed exercises and adjusted them so I would not become discouraged. Slowly, I could see weight loss and an improvement in both my endurance and strength. He also did his best to accommodate my schedule. Would you recommend a friend? Absolutely, now that I have a normal schedule, I will recommend Healthtrax East Greenwich whenever there is an opportunity.